I am getting some questions about Greece. Will it leave the Euro? Will the EU fall apart? Will Russia bail them out? Will the market crash? The new “marxist” government’s moves are being watched and reported on a daily basis. Even the clothing of the new ministers has become “news”. And the finance minister describes himself as a “libertarian marxist”…? What to make of all this? I have the good fortune to be able to spend a good deal of my time in this ancient country, so let’s do one article for it. 1) The eurocrats in Brussels and traditional parties around Europe are scared. They are not so scared that Greece will leave the euro or fall into an even deeper crisis, because then they can always say “told you so”. They are much more scared that the Greek economy would improve too much under this new government. It would be most “inconvenient” for the politicians that be if a country recovers by refusing EU “help”. So, whatever happens in the next months, if the result a few years down the road is that Greece is growing faster than e.g. Italy or Spain, then what are voters in those countries going to think? That puts the EU in a delicate balancing exercise. 2) The newly elected government parties in Greece cannot afford to go along with all the EU demands, that would be political suicide for them. But the going idea is that this new government has very little leverage and will be forced to bend to EU and ECB demands very quickly. Is that so? If it gets pushed too far this government will probably “experiment” before it bends. The new Greek finance minister responded and thanked for the idea. That suggests to me that he is familiar with Gesell’s ideas and how they can be used in a country that is in depression. 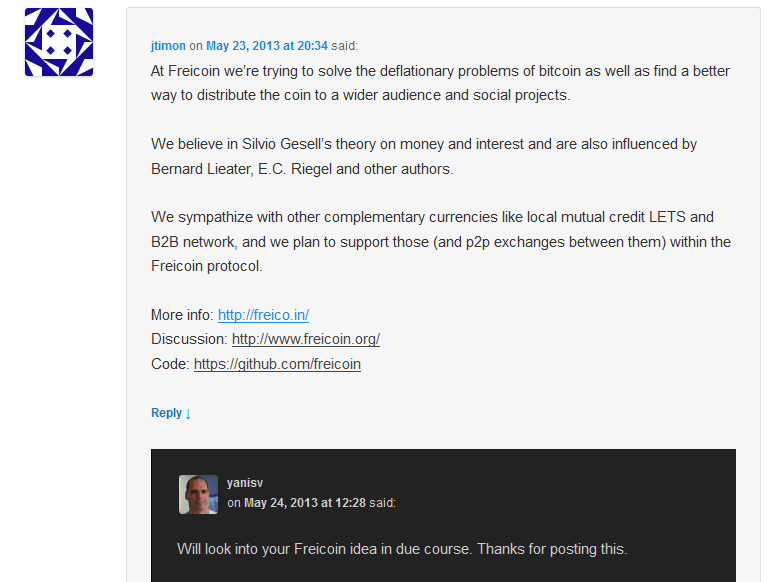 Greece could indeed issue an electronic parallel currency that would become used alongside the euro, similar to what was tried already by Freicoin. It could be presented as a kind of social program, much like the major of Worgl intended 80 years ago, putting a lot of jobless Greeks to work and at the same time it would generate new tax revenue (based on the demurrage fee). This new currency would circulate fast, as there is no point in trying to save a currency that has a monthly demurrage fee. This could revive the local economy in ways that the euro will never do. As the Greek government uses that new electronic scrip for its social programs it would have more Euro left for other purposes, like repaying its debts. What’s not to like? How would the markets and its EU partners respond to such an initiative? That’s hard to tell. But I don’t think there is any EU law that could stop Greece from trying this. And it may be one of the cheapest forms of social program they can try. Instead of just giving free electricity or food to people, it makes more sense to give them some “social scrip” and then let that new “money” circulate, lifting the economy out of depression in all those cities and villages where the remaining euros have become stashed away in mattresses. It is one of the things they may try. It would also mean they stay in the euro but get something like their own drachma back at the same time. I doubt this government will bend down to EU pressure without trying something new. And this is something that has worked before in similar circumstances. Would it work again? I don’t know. Anyway, if Greece goes “Gesellian”, you heard it here first. This entry was posted on February 6, 2015 at 1:24 pm	and is filed under Market Commentary. Tagged: austerity, Greece, Lietaer, Silvio Gesell, Varoufakis, Worgl. You can follow any responses to this entry through the RSS 2.0 feed. You can leave a response, or trackback from your own site. Libertarian Marxist? Seriously, talk about an oxymoron. Politicians are experts in heaping platitudes upon themselves no matter how erroneous and ridiculous they may be. Marxism in anything be it politics, economies or even day care centers is doomed to failure. How many Marxist entities need to fail before the light bulb finally goes off. All that can be said for sure is Greece is in for a very long slog here. Adding more Marxism into the equation will only add more pain to the suffering. People may want to review their thinking about “Free” stuff, “Free” social programs, nothing is Free, the money must come from somewhere and it usually comes from robbing Peter to pay Paul which ends in piling up insurmountable debt. And that is the story of Greece.